Since there are now 1000 posts on this blog, I thought I might write another with some reflections. We’re also about to go on holiday for a few days, the last before my daughter heads off to university, so there probably won’t be much activity here for a while. Overall, I think engaging in discussing this topic publicly has been a mostly positive experience. It’s forced me to think more about the details of the topic, about the scientific process in general, and about how to engage publicly; I’ve learned a lot. However, I think I’m also more negative about things, while – at the same time – caring less about this. The latter is more a survival mechanism; I don’t have the energy to be as passionate about this as I was once. The reason I’m more negative is mostly because of the general tone of the discourse, and I don’t just mean between those who accept that climate change is a problem worth addressing, and those who don’t (or who mostly don’t). Even amongst those who mostly agree about climate change, the discourse can be pretty poor. There seem to be never-ending turf wars between those who mostly agree about climate change, but have different ideas about the optimal way forward. There’s cultural cognition versus consensus messaging, there’s nuclear versus renewables, there’s social scientists versus physical scientists, and there’s conflicts about framing and narratives. I think it’s one thing to criticise what someone has said (i.e., if it’s incorrect), but another to criticise the way in which they’ve chosen to frame things. There are many valid ways to frame a public discussion about a complex topic, and I don’t think anyone has some right to decide what way is the correct way to do so. There may well be cases where publicly criticising the way something has been framed is appropriate, but I sometimes think it’s more about someone promoting their own preferred narrative, or their position, than about improving the public understanding of this complex topic. To be fair, I think there is a better public awareness about the seriousness of climate change than there was a few years ago. However, my sense is that we’re still going to spend the foreseeable future having these turf wars, where people who agree that something should be done, spend their time fighting over details. People are, of course, free to criticise whoever they want, whenever they want, but it’s (in my view) worth considering the consequences of doing so, and why you’re doing so. Is it really to improve public understanding, or is it mainly about promoting your preferred narrative over that of someone else? My own view is that this is bigger than any individual, or any group. Ideally, we would like there to be a better understanding of what is an important topic that will require us to do things to address it. I think it would help if people’s default position were to be supportive of those whose underlying intent is to inform, even if the manner in which they’re doing so isn’t necessarily how you would do so yourself. I think it’s unfortunate that this isn’t always, or even often, the case. To be clear, I’m not suggesting that I always got this right, get it right now, or will always get it right in future, but my goal is to try. I may even be wrong to be negative about this; maybe these conflicts are an important part of developing the way forward. In fact, since they’re likely to continue, I hope this is the case. This entry was posted in advocacy, Climate change, ClimateBall, The scientific method and tagged Conflict, Framing, Narratives, Public understanding of science, Science communication. Bookmark the permalink. quite right and clearly articulated. I always appreciate your style and the intent it reveals. Hope your daughter gets settled in at University and has a wonderful life. It’s a big transition to have children leave the home. My partner and I are blessed to have had our oldest daughter and two of her sons move back in with us. It’s a joy to share our huge (3000 sq ft) home with more humans. We have done a lot of work to make the old house comfortable and to reduce its footprint as habitation. Having a bunch of humans in residence reduces our collective footprint ever so slightly. We all do what we can. We all see too easily what others are getting wrong. I think the best way to deal with that is to ask questions. To always shift back to questions as often as possible. Sincerity and honesty are also helpful, but in the end, disagreements occur and it is on us to keep it civil and trust that others are doing the best they can. I have also gotten much more negative over the past decade. I no longer think our species has much chance of sufficient, timely change to prevent a calamity, so my focus has changed to faith and inspiration from a more gaia-like identification with the capacity of this planet, our amazing home, to rebound from calamity and become a verdant oasis in the universe. It takes a little time, but 5 known great extinction events and successful rebounds each time so far. We are lucky to be alive and witness to this amazing planet. I just asked someone how much the sun has changed over the last century. When finally a fantasy number came, I asked for a credible source. One of the issues leading to the likely self-imposed replacement of humans (I’m already advising the roaches to polish up their carapaces and prepare for office) is that the rare combination of a high IQ and common sense results in a mind that will avoid politics, leaving it to be conducted by individuals possessing neither. QED. Discuss. Kind of illustrating my point. To be fair, I’m dubious about 100% renewable solutions, as well as 100% nuclear solutions. ATTP, your blog role tells you to update your blog role. I was working on that a few days ago, but missed that. Should be updated now. Perhaps the most sensible course would be to use all available low-carbon technologies. So sure, the anti-nuke brigade are wrong to try and push nuclear off the table before we’ve even seriously started decarbonisation. But the anti-renewables brigade are equally wrong when they try to claim that nuclear is the only way to go. The more technologies in play, the greater the chance that we will avert some of the worst climate impacts. Hey, Canman, I think we are globally pretty committed to a mix of power sources for the next century with a significant amount of nuclear generation, hydro, solar and wind already in place. I think the problem is the amount of CO2 that we are generating with the fossil fuel component of our power infrastructure and approaches. So, as we look ahead and try to figure out how to severely reduce the power infrastructure that produces CO2 on an ongoing basis, we have to figure out how to reduce demand through changes in lifestyles, through efficiency improvements, etc. and we have to figure out what the energy mix of the future is that allows us to stop the rise of CO2 in atmosphere and oceans and start reducing the accumulations. Discussion of 100% approaches doesn’t make a lot of sense to me in this scenario, does the 100% approach to energy make sense to you? The problem with nuclear seems apparent at places like Chernobyl or Fukushima. Are there any good nuclear cleanup technologies on the horizon? I feel like we are waist deep in the big muddy with failure to have a cleanup plan on fossil fuels and I am attracted now to energy approaches with smaller cleanup issues. Does that make sense to you? In the video, they still plan on utillizing existing renewables, but say it’s hardly worth mentioning because it’s such a small fraction of the total. There’s probably a lot of places where renewables make sense and I don’t think anyone is calling for an outright ban. But there’s also a lot of subsidies that give renewables an unfair advantage over nuclear, especially Renewable Portfolio Standards that exclude nuclear. The best place to spend limited government energy funding resources would be IMO on tooling and experience with nuclear. I would include AP100’s (Advanced Passive safety Third Generation), just in case there turn out to be problems with Forth Gens. About cleanup with fossil fuels, if we hadn’t pumped so much oil out of the ground, a lot of it would probably have seeped out anyway in Le Brea Tar Pit fashion. Odd that not one single plausible source supports this claim. Maybe not in every single kilowatt, 100% WWS,Jacobson fashion, but we could clearly get the vast majority of electricity from nuclear. But your “we” probably isn’t a global “we”. There may well be regions/countries where nuclear could play a major role, but there are others where this may not (yet) be possible. Canman. I like fish-and-chips. I also like curry. I could probably live with either. But there’s no need to, I can have both. Ditto with renewables and nuclear. have you checked out the bill for Hinckley C? And based on nuclear’s track record, that’s a gross underestimate. Windmills are low tech and millennia old. And PV has a proven track record of order-of-magnitude cost reduction. Nuclear, not so much. Nevertheless I support both. Horses for courses. If only Because Politics. Germany is being stupid about nuclear Because Politics. The USA is being stupid about renewables and coal Because Politics. People can be stupid. Because People. Best to hedge our bets. Canman, re La Brea. I speak from expertise here, as someone who’s actually modelled hydrocarbon generation and expulsion for a living (Including leakage to surface, generally the vast majority). And had my employer spend hundreds of millions testing my conclusions. You’re wrong. By three to six orders of magnitude, depending on the basin. I would also like a source for the claim that renewable energy is subsidised more than nuclear. 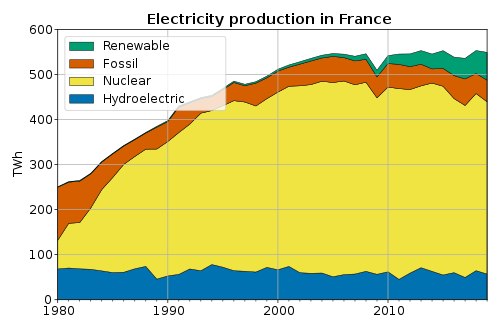 France can have a lot of nuclear power because they can dump their electricity at night in the rest of Europe. We thank them for their economic support. If all countries would do that the electricity at night would be wasted, making nuclear even more expensive. Nuclear has the same problem as sun and wind that it does not follow demand. We will need some mix, we will need a market to bring supply and demand together and from that large scale storage will develop once/if it is needed. Several countries are already 100% renewable. The same demographic that wants to start wars to prevent Iran and North Korea from having (more) nukes seems to feel the only acceptable solution is nukes. But global warming is a global problem. I would rather export solar panels than nukes to Congo or Zimbabwe. That’s essentially a repeat of your earlier unsubstantiated claim.Plausible estimates converge on ~20 – 30 percent global electricity generation (*not* TPE) by mid-century. Countries with higher renewable shares of their energy mix tend to be privileged by access to a natural resource – usually hydro – usually combined with relatively low per-capita energy use. They are not examples of what is possible for all, any more than France is an argument that the entire world can largely be powered by nuclear. Having a plan for closing down the German nuclear power plants created a large market for sun and wind power. Together with feed-in tariffs reducing investment risks for a business were capitals risks are a main cost factor, this has created a huge boom and a *global* drop in the price of sun and wind power. That the German CO2 emissions thus did not drop as much is secondary compared to the global drop in prices, which has given me new hope that humanity may solve the climate problem against the resistance of the elite and the hard right. I would have preferred to close down the lignite power plants first, but politics is the art of the possible. A reflection: most people on climate blogs are absolutely impossible to shift from their pet obsessions by the application of facts, whether these obsessions are nuclear or otherwise. I very much doubt that these self selecting obsessives are representative of the wider population. Countries with 100% renewable power are: Albania, Bhutan, Ethiopia, Iceland, Lesotho, Nepal and Paraguay. I was responding to the general claim that 100% renewable is stupid. Island nations that want to be isolated at any cost will naturally have more trouble getting it done than others. Actually, that’s a good point. I do realise that what I observe may not be representative of most of what’s going on. On the other hand, we do have Trump and Brexit? On the other hand, we do have Trump and Brexit? Xenophobia and grievance are universal human attributes, ATTP. I’m not sure that Brexit was influenced by the obsession with obscure details of the statistical analysis of tree rings, the viability of high renewable energy penetration or any of the other obsessions of the climate “sceptics”. And Balls to Trump (9pm BBC2, the first two episodes were rather good, I thought). Maybe not totally appropriate comparisons, but I was mainly meaning that I may be wrong about the typical discourse being better than what I observe. Thanks for the TV recommendation. I will have to try and watch that. Every Sunday we have a panel of journalists discussion some current topic called Presseclub, something like Washington Week. Last week the topic was that the public debate had become so heated. However, they had a hard time defining what was worse today than in the past. When I was young in The Netherlands the debate was between “I’d rather have a cruise missile in my garden than a Russian in my kitchen” and “I’d rather have a Russian in my kitchen than a cruise missile in my garden”. In Germany there was left-wing political terror. In the UK religious violence. Much earlier in America there was the civil war and segregation. The Nazis put communists and social democrats in concentration camps, if they were not immediately killed. Many parties in the 1930s had organised violent groups. We do have quite a lot of right wing terror nowadays (called mentally ill lone wolfs), but it is not that clear whether it is really worse nowadays. Maybe what is different, and also typical for the climate debate, is that people no longer try to make arguments that could convince someone else. Trump claiming his inauguration was the biggest ever. People claiming global warming is due to the sun, without giving any indication that they know that science has studied this and that they would have to make a new argument. That is a pity, I like debating and I also like to understand why other people believe what they do, but if people no longer try to make sense (and in the worst case are in addition rude), it becomes tempting to use the mute or block button. as for people with their pet obsessions, I think ATTP appreciates it when we treat each other gently and respectfully, so we have to shrug off the pet obsessives when they come with their “this idea is stupid” approach and either refuse to take the bait and let the conversation devolve or ask questions and give examples in a gentle manner that might suggest a rethink of the “this idea is stupid” position and framing. If the pet obsessives are really down their own little rabbit hole or if they are posting in bad faith with the hope of just getting an online argument going, then the conversation will not be effective. I believe it is possible for people to learn new things and change their positions, but I know it’s not easy. Luckily we do have folks around who will tell us when they know more than we do, then we can get to our studies. I’m not sure exactly what “this” is referring to. If “this” is referring to the topic of climate change, I also think the topic is somewhat limiting, which is why I’m much more interested in climate science research in general. And earth science as a discipline is wide open for investigation, which is exciting. Here in NZ we are 85% renewable for electricity. I dont believe nuclear should be discussed as an option for NZ purely because we are one of the most geologically unstable regions on the planet. There is unrealized potential in tidal and geothermal energy that the massive amounts squandered on nuclear research would probably enable. The time to squabble over how we go about a transition from fossil fuels was thirty years ago. Any one rational watching the news can clearly see the catastrophic effects of climate change already being experienced around the globe. The imperative now is that we transition to any form of viable lowcarbon energy to halt our destruction of a habitual planet for future human civilization. I would have preferred to close down the lignite power plants first, but politics is the art of the possible.. I agree VV. That’s what I meant by Because Politics. Some countries will follow sub-optimal paths because they’re afraid of bogeymen, whether it’s radiation, taxes, regulation, or the mistaken belief that life is a zero-sum game and giving greenies something they want necessarily harms conservatives. We need a broad spectrum of alternatives, and they all need to benefit from continuous development of the technology. One reason the UK had to outsource Hinkley C is that we hadn’t built anything for so long, the people who knew how to do it were retired or dead. And nobody new trained for what looked like a dead-end job. Taking breaks is very important. That is why most of the sports have seasons. The recovery gives you time to get the passion back. You have a wide range of contributors and even in house a wonderful diversity of views. Looking out though is just as important as looking in and understanding that people who have opposite views are still just people, like yourselves. Some good, some bad. Some looking for information, some not. Keep supplying it is all. But something has to trigger it BBD. Any interpretation of Brexit has to explain why Scotland voted 62:38 Remain and England voted 53:47 Leave, 55:45 outside London. Even cosmopolitan London only voted 61:39 remain. Edinburgh voted 74:26 Remain. Scotland outside Edinburgh 61:39 Remain. Every single reporting district voted Remain, from rich suburbs, through big-city housing estates, to isolated farming and fishing communities. And yet Scotland is whiter, more working-class and more rural than England ,so those usual suspects fail the cross-border-comparison test. My interpretation: having the best story is more important than having the best facts. The narrative was about English exceptionalism. Unsurprisingly, that wasn’t too convincing in Scotland. One Brexit explanation is of course the pejorative “Little Englander” meme. In its posh version, it’s that England lost its identity with the Empire and hasn’t found a new one. The idea being that the Scots were always aware of their separate identity and saw themselves as “servants of the Empire”, whereas the English thought of “British” as just “Greater English”, where they drew a distinction at all*, and considered themselves “masters of the Empire”. But nostalgia for something that disappeared when I was a toddler? A less Imperial version is that Scots have always been aware of their dual identity as Scottish and British, so found it easy to add a third European identity, but the English/British confusion mean that the English had always had only one identity and never felt comfortable with a second. In that case one might expect to see a similar pattern on mainland Europe. Although it’s easy to imagine that would be swamped by memories of WWII, the Iron Curtain and post-1989 breakups. * A classic of the genre was then-PM John Major’s remarks equating “Britishness” to sitting outside a village pub, drinking warm beer while watching a game of cricket on the village green. In Scotland we generally like our beer chilled, even dark beers, we don’t have village greens because we had a different system of medieval land tenure, and we don’t play cricket. Another potential explanation, which I don’t see written about so much, is that since 1999, a lot of the day-to-day, in-you-face stuff has been devolved to Holyrood. And Holyrood (a) has proportional representation so you don’t get the big left-right swings of Westminster, and (b) has always had a soft-left majority, which in recent years has tried to ameliorate the impact of austerity, and was to the left of Tony Blair’s Labour so resisted ongoing privatisation programmes. The real impact must have been small because it’s mostly funded by a block grant, scaled to English spending, so it participates in cuts and can only move money around. But perhaps it was enough that the people in England who feel left behind, don’t feel left behind in Scotland. But that also raises the question: “why was it important enough for people to vote against their own economic self-interest”. Not just over Brexit, but in electing coalition and majority Conservative governments whose policies are leaving the left-behind even further behind. having the best story is more important than having the best facts. The story behind the need for austerity, and the blame of Labour overspending, is a powerful one, regardless as to whether you agree with it or not. Well, the really-left-behind have certainly not benefited from the bedroom tax, benefit freezes and changes to Family Credit (which benefited the working poor more than it did the unemployed, and it’s often claimed that the “working poor” is the demographic which “won Brexit”). And the Brexit leaders have more-or-less given up on promising jam tomorrow, in favour of the Dunkirk Spirit. WRT the General Elections, it’s possible that those people contributed to the higher Labour vote in 2017, having finally realised that austerity was not benefiting them and that the promised sunlit uplands remained over the horizon. And that it was returning UKIPers who kept the Conservatives ahead. And anyway governments around the world got kicked out following the 2007-8 crash. It wasn’t a left-right thing, just who was holding the baby when it screamed. (I considered a nappy metaphor there but decided I wanted to retain my lunch 🙂 ) So maybe only 2015 remains to be explained. The polls swung when Ed Milliband was depicted in Alex Salmond’s pocket. So back to English Exceptionalism. Didn’t want the SNP pulling the strings. Instead we get the UUP. Strange times. Anyway, drifting well off topic 😦 . Estimating the equilibrium climate sensitivity (ECS; the equilibrium warming in response to a doubling of CO2) from observations is one of the big problems in climate science. Using observations of interannual climate variations covering the period 2000 to 2017 and a model‐derived relationship between interannual variations and forced climate change, we estimate ECS is likely 2.4‐4.6 K (17‐83% confidence interval), with a mode and median value of 2.9 and 3.3 K, respectively. This analysis provides no support for low values of ECS (below 2 K) suggested by other analyses. The main uncertainty in our estimate is not observational uncertainty, but rather uncertainty in converting observations of short‐term, mainly unforced climate variability to an estimate of the response of the climate system to long‐term forced warming. but rather uncertainty in converting observations of short‐term, mainly unforced climate variability to an estimate of the response of the climate system to long‐term forced warming. Which is essentially what I said. You’re measuring something noisy (that relies on forcing models to interpret the observations so is not truly “observational”), measuring apples not oranges, and hoping that the apples you’re measuring bear some relationship to the oranges you’re trying to measure. At least they, unlike LC18, recognise and are up front about the difficulties. And at 2.4 – 4.6 K, they closely match the PALAEOSENS 2.2 – 4.8 K. I can feel a consilience coming on 🙂 . Bye, bye 1.5 K, and all your cousins. Congrats on 1000. Good time for reflection after the hothouse thread. John Hartz and vtg make good points. No matter what the point of view, climate is an emotionally-charged subject. That’s why most disengage. While we get other benefits, I’m guessing that many of us wouldn’t come here if this site didn’t improve our emotional well being in some way. Testing or defending our world views and connecting with like souls come quickly to mind, and there may be others. While we have been plowing familiar ground for some time in climate science, I have a feeling that our Anthropocene trajectory may become more interesting in the next 10 years or so: 1) We’re leaving the Holocene, 2) The economic advantages of fossil fuels are disappearing 3) The world geopolitical order is being stressed. So I foresee a continuing need for this blog and who knows we may even see a world view (or two) changed. Very few behaviors on that scale are unforced. Consider that the annual cycle is certainly forced and the millenial scale cycles are thought to be forced (ala Milankovitch). Why would the variability in the range between these two scales be unforced? Paul, I’m sure they’re referring to net radiative forcing, which is what they use for ECS calculations. Tidal and other cyclical forcings are, well, cyclical. The don’t add to the heat content of the Earth, merely move heat around. For the purpose of assessing the last few decades of warming, we can treat Milankovitch forcings and the tiny amount of heating caused by the Moon’s gravitational torque as constant or immaterial. I wouldn’t marginalize the significance of this. To better estimate the secular trend of the AGW signal, you need a way to discriminate against the natural climate variability. The way this is normally accomplished is by a multiple linear regression on all the factors. The residual is typically reduced in “noise” and so more clearly reveals the trend. Lean and Rind (2008) and Foster and Tamino (2011) are examples of how to do the multiple linear regression. All the factors are forced, whether by CO2, volcanic, TSI, ENSO (via tidal forcing). The only significant factor that is still up in the air appears to be correlated to long-term (~40-60 year) LOD variations in the earth’s rotation rate. This may turn out to be of tidally forced origin as well, since LOD on every other scale (from days to months to annual and interannual) is clearly shown to be synced to lunisolar tidal cycles. True Paul, but for historical energy balance models, we don’t need to predict ENSO state. We can measure it. We do need to understand better just how it partitions energy within the ocean and between it and the atmosphere, and how it affects cloud reflectivity, per the Drijfhout paper mentioned at the bottom of the previous thread. Understanding ENSO better obviously helps, just as understanding everything better helps. It’s also about the AMOC and the PDO. That’s why many of El Niño events of the first decade and a half of the 21st did not produce big upward spikes, and why the La Niña events “flattenedished” the GMST. Earlier this year there was a paper by Wills on the PDO that appears to be very good. There are papers that indicate GW will compress the PDO cycle. I don’t see how that can be good. ECS is going to be high. My number has been a hopeful 3.4 ℃. Ah, it looks like we’re in agreement then JCH. I presume “So far, I’m an acolyte of Bob Tisdale; I’m a luke warmer; I can’t read. interesting.” should have had /sarc appended. Poe’s Law applies. (or reverse-Poe 😦 ). Apologies. I was puzzled, both wrt what I recalled of your previous stance and the -Tisdale search. Which I must have assumed was a devils-advocate way of saying “it’s not just Tisdale”. Still, you could have done a Science-of-Doom thing where IIRC he went laboriously through simple calculations to more complex models, then at the turn of the year turned round and said all the models are running warm Because Gut Feel. Clearly not. Oh well, it did make me read that paper yesterday, which I’d missed, so not all wasted thrashing around. And the whole alphabet soup of transient, effective, equilibrium (before the system has reached equilibrium; even if the GCMs have – we know they miss out slow feedbacks) and earth system doesn’t help communication. So I will read the other paper carefully at some point to see if they’re talking about two different ECS’s. And now that I’ve thought about it a bit more, I realise that even my original concept (that ENSO or whatever brings warmer water to surface where it can contact the atmosphere) isn’t the ocean giving heat back to the atmosphere. It’s also the ocean taking up heat from the atmosphere more or less slowly. ENSO doesn’t bring warmer water to the surface; it spreads the 30° water that normally resides west of the date line over the entire eastern Pacific. The east Pacific cold tongue gets completely buried under the warm less dense water. The cold tongue can get very cold–when we were on the equator near the Galapagos during the 1989 La Nina, it was 20°; typically it is about 22°. Because it is typically cold, it can absorb lots of sensible heat. Additional heating of eastern Pacific water during an ENSO event causes heat loss through evaporation and leads to the floods on the South American coast. Doubly wrong then 😦 . But I take the first one more seriously because it’s the sort of thing I take seriously when I’m thinking rigorously and that annoys me in others. Conflating a slowdown with a decline, a reduced uptake rate with a reversal, a change in first derivative with a change in second derivative, weight with mass, weight with density, stress with strain, vector with scalar, etc. All the things we (or at least I) am sloppy about in everyday speech but which are inappropriate in a science discussion. The mechanism underlying ENSO is not close to being in any kind of consensus. Depending on what you read, it’s largely unpredictable and either chaotic, red-noise, or deterministic in some non-chaotic yet complex pattern. You are right that the ENSO mechanism is not adequately understood, which is why IPCC AR5 puts a low confidence on projected changes by the 21st century. And, we have been discovering different flavors of ENSO so that the geographic pattern of surface warming is not always the same. 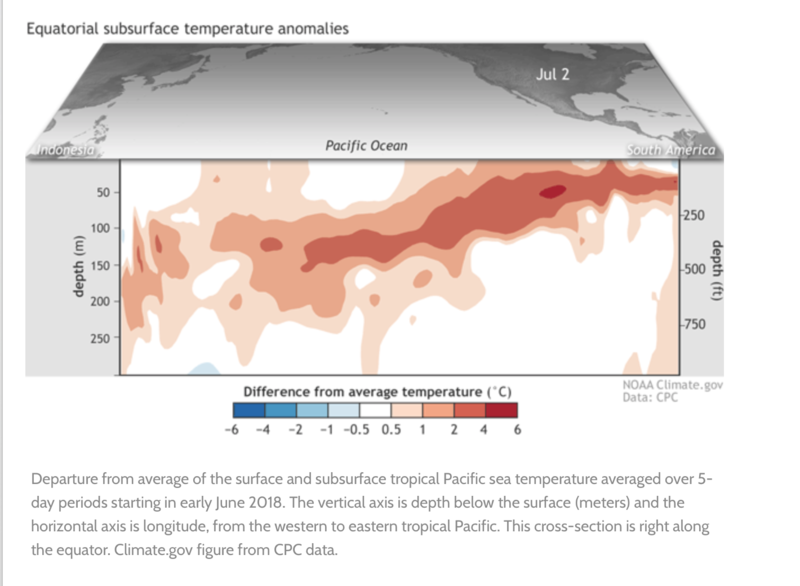 Nevertheless, the surface extent of warm water in the tropical Pacific always expands. Yes, there are different flavors of ENSO, which I think may just be different standing wave number patterns. One of the behaviors observed recently associated with ENSO is referred to as Tropical Instability Waves, which typically has a wavelength of 1100 meters, not standing but traveling east to west. The reason I think this family of behaviors is not chaotic is because of the consistency in the standing wave patterns. The nodes of the standing waves are topologically fixed, likely aligned to boundary conditions. Rare to find any reference to “chaotic standing waves” in the research literature under any wave topic. If ENSO was truly chaotic, one might expect to find many more different standing wave patterns which would come and go depending on the attractor path. So if you do run across some examples of a chaotic standing wave, I would be interested. Based on observations and climate model results, it has been suggested that the recent slowdown of global warming trends (climate hiatus), which took place in the early 2000s, might be due to enhanced ocean heat uptake1–8. Here we suggest an alternative hypothesis which, at least in part, would relate such slowdown to unaccounted energy reflected or reemitted by clouds. We show that the daily cloud cycle is strongly linked to pacific decadal oscillation (PDO) and that its decadal variations during the climate hiatus have an overall cooling effect. Such an effect may have partially, and temporarily, counteracted the greenhouse warming trends.</blockquote. “Doctors define fever wrongly. The threshold is only 1°C above normal body temperature. That’s not a fever fever”. What’s wrong with that statement? “Brain damage from fever generally occurs at 5°C above normal body temperature. That’s only 2% warmer than normal. The doctors must be wrong, something else must be causing the brain damage”. And this one. It’s presented as a hypothesis, on arxiv. So not published, although at least informally peer-reviewed. Early days though in terms of its staying power. They say clouds modulate the increasing AGW trend. But compare Fig. 3 with Fig. S2. Which more closely matches temperature, DCCRE or PDO? PDO. Does that make it more likely that PDO is the driver and changes in cloud cover a feedback? The dog wagging the tail rather than the tail wagging the dog? Seems intuitively likely, but intuition is a poor guide in science. I see they don’t reference Drijfhout 2017. In both papers ENSO state influences cloud cover which influences surface temperatures. Introducing an obvious correlation vs. causation issue. Yin & Porporato do seem to come down on the side of a PDO driver and a cloud feedback. The authors work in agriculture, so have an obvious interest in clouds and rainfall beyond balancing the energy books. And in what they’ll do in the future, as we go further and further out-of-sample. The similarity in the DCCRE and temperature trends is strongly suggestive of the existence of a feedback loop between them, whereby the ocean circulation affects the patterns of sea surface temperature, which influence the lower-tropospheric stabilities and large-scale atmospheric circulation. These changes in turn may influence cloud dynamics inducing changes in daytime and nighttime clouds, whose impacts on the Earth’s energy balance end up reinforcing the patterns of sea surface temperature (see Fig. 2 and Supplementary Fig. 3). As a result, the climate system remains ‘locked’ for an extend period of time, in a hiatus-type of behavior, giving rise to a staircase-like function of global mean surface temperature. It’s a pity they didn’t include 1998. CERES was apparently flying then. It would have been instructive to see if the pattern repeated itself, or if it was stronger because 1998 was a bigger El Niño. Drijfhout is perhaps is a bit the other way round “Before the ocean releases heat to warm the atmosphere via turbulent fluxes, the ocean is warmed by larger amounts of solar radiation, and vice versa for heat uptake and cooling.” Although he’s looking at the whole globe and also brings in sea-ice fluctuations, which presumably gets into another correlation vs. causation area with inter-hemispheric coupling. I see he also has an interest in AMOC. It’s complicated 😦 . I can see another discussion with Willard looming over cause vs. Cause and shut-up-and-calculate vs. Meaning. Ironically, in light of angech’s unfounded claims on the other thread of ECS being tuned to fit preconceptions, this is the sort of area where I get frustrated that climate researchers stick too much to the pure physics and don’t tune their models. As with Cowtan & Way (what, they don’t do smart interpolation like kriging, why ever not? ), this is an area which would be ripe for intervention in reservoir engineering. It’s called history-matching, not tuning, and pseudo(-propertie)s, not parameterisation, but if you found your model was matching the sign and pattern of reality, but the amplitude was too small, the first thing you’d do is tweak some pseudos until the amplitude was right. Then rinse and repeat until you got an acceptably good match. more tweaking and tuning is in order. but we want to watch. always wondered.. when i see a long station that is cooling trend in a region of warming..how the hell??? Weren’t you on the BEST team Steven? Surely you did this stuff. I thought you were the bestest? They guys who sorted out the mess left by the dumb geographers? My guesses: Broken instrument? Time of day change? Sloppy technician? Some one built a chimney nearby? Global warming led to a local increase in cloudiness? Some one built a series of poorly insulated houses nearby and the data has not yet been homogenised? It was on the edge of a city and they progressively moved it up-slope as the suburbs grew? It’s not real – you read about it on some WTF site or other and you’ve been lied to? Investigate! The world needs to know! After all, if it’s cooling really fast maybe it’s enough to outweigh the thousands of other stations and the world is not warming after all! Then we can all relax! To perhaps forestall a philosophy-of-science detour, which is the primary cause may be an ill-posed question in a system with complex mutual feedbacks, cyclical as well ad secular drivers, and the potential for emergent behaviour. Where you have a clearly observed forcing based an known physics or chemistry, it’s reasonable to identify a primary cause. GHG addition to the atmosphere, which represents about half of our known emissions and which is isotopically identified as coming from organic carbon more than 70,000 years old. Northern Hemisphere insolation changes driven by orbital cycles. A large injection of inorganic carbon coinciding in time with a Large Igneous Province, which extruded lavas which are known from modern analogues and from mineral thermodynamics to have contained significant dissolved CO2. Etc. I am not sure whether it is worth posting a comment on your website. Are you an open forum for discussing global warming, or just an alarmist echo chamber? Are you an open forum for discussing global warming, or just an alarmist echo chamber? I tend to have a low tolerance for comments that promotes scientific views that are clearly wrong. If you want to call that an “alarmist echo chamber” go ahead. Serendipitously, Drijfhout has another paper just out. A novel probabilistic forecast system predicting anomalously warm 2018-2022 reinforcing the long-term global warming trend. Looks really cool (no, not that kind of cool – kinda warm actually 🙂 ). His last one and the Yin & Porporato preprint were getting under the skin of ENSO and other natural variability and feedback contributions to the “hiatus”. Looks to me that the community is starting to get a handle on cloud interaction and whether it nets out as a positive or a negative feedback. I expect Yin & Porporato to get a lot of attention from misguided lukewarmers because their clouds contribute a cooling effect. But that’s as a feedback to a PDO cooling effect. IOW because it has the same sign, it’s actually a positive (reinforcing) feedback, not a negative feedback. It makes natural variation stronger and more persistent, and further undermines claims that the long-term forced warming ever stopped. As the authors acknowledge, this looks superficially like a cheap and easy alternative to the Met Office supercomputer’s Decadal Prediction System. But it leverages the full CMIP5 dataset which was far from cheap or easy to compile, and only predicts single global averages rather than multiple parameters regionally. So horses for courses. The CMIP5 model ensemble has more dispersion than the observational data, which is something I’ve thought for some time. We get so busy pointing out that the observations have not excursed beyond the 5%-95% range, we forget that they should have had about one positive and one negative excursion per twenty years. So the model spread is too wide, between models, within models, or both. It’s interesting that their model performs better if all the CMIP5 simulations are left in than if the less-well-performing ones are excluded. Contra the appeals in some circles to throw out the ones that don’t represent ENSO well, get clouds wrong, or whatever. The distinction between reliability (getting the mean and standard deviation right) and skill (getting individual spot predictions right) is IIRC a meteorological thing and perhaps underused by those coming from a physics/geophysics background who tend to focus on getting the mean and variance right. Maybe they just throw up their hands and say “it’s too hard to be skilful”, but meteorologists get their feet held to the fire by their customers. I could have done with that in my earthquake discussion with Paul P a while ago. We were getting hung up on whether predictions were good or poor, with different definitions of “prediction”. We could probably have agreed that the reliability was good (statistics well known and well represented), but the skill was poor (on which week, month or year will it happen?). Interesting times. Maybe the claim that there’s been nothing new in climate science since 1980 is on shaky ground 🙂 . It’s all about the Eastern Pacific. Right now the PDO is essentially neutral. The NOAA PDO bumped up in July/ JIASO July not out yet. Based on 20th century behavior, it surges upward, falters a bit, and surges again, so their forecast has a some historical backing. If the PDO surges again, then by 2022 the 30-year trend will be sky high. In my own simple ways, I have been saying this exact same stuff at Climate Etc., a cesspool, since around 2011-2012. The PDO is badass; ACO2 is nasty; luck warmers are dead wrong; globally, the AMO does almost nothing. The stadium wave, the cooling part of the wave, took place from around 2003 to 2013. It did almost nothing. But I’m just a cowboy who plays bluegrass. Sorry, for posting just the url links to the above articles. I’m on a tight schedule today. Please refrain from piling on, more so on matters that turn to be about playing the ref. If anyone wants to engage with Sheldon Walker, he is posting at Real Climate. Ironic that ATTP writes that binaryism (my word) is unhelpful and a few commenters (nameless but obvious) pile in and demonstrate the point wonderfully. I wrote a piece on “Ending the Climate Solution Wars: A Climate Solutions Taxonomy, on exactly this issue. Dogmatists with little knowledge but a ‘gotcha’ link to a paper they barely understand will be the starting point for a rants about why this is the ‘only’ solution or that is impossible. Sometimes the proponents of one approach don’t help themselves. A great heuristic in problem solving generally is to use ‘divergent thinking’ early, especially when seems that people are over-focusing on one solution (I used divergent thinking in my professional life, creating strategies and plans to reform enterprise information management, in global organizations with a mess of thousands of systems, paper mountains and the rest), and as ATTP says, keep asking questions; 5 “whys?”, and more if required. One could come waving a piece of paper saying “I have THE solution!” – based on the latest silver bullet (Big Data, New Modular Nuclear, etc.) – but that approach always fails, and thankfully I learned that early when much younger and still quite naive. As I have noted elsewhere, we need as much time modelling futures in both power, but also land use, and other aspects of a decarbonized society, and grand claims need to be tested. But we need a collaborative and thoughtful approach. We have GCMs++, IAMs, but we need a third class of modelling – being done by some but not at the depth or scale required. I like the work Ken Caldeira and his team have been doing. He shows that getting to 80% renewables in USA is relatively straightforward (in terms of the storage required), but the last 20% is much harder while not impossible. I’d be interested how that looks with a restructured energy network – covering national, regional, local and domestic scales of demand and supply management. It is not clear to me that this work has been done. Software engineering will be at least as important and Electrical engineering in solving this puzzle. Certainly, the CAT’s (Centre for Alternative Technology) Zero Carbon Britain (ZCB) have shown that a ‘power down’ (find ways to use/ emit less), ‘power up’ (RE) approach can deliver 100% renewables, but yes, with a lot of storage (chemical, not batteries, using synth gas). ZCB, unlike many others, factors in land use, transport, food, etc. in a holistic way (i.e. not solely obsessing on electricity generation, which is what often dominates political debate). Try to raise land-use with politicians (in all parties) and they seem to have very little to say, so they resort to platitudes on energy generation (and again, not realising the scale of the transformation required). I believe nuclear will remain import as a bridging low carbon source, but there is very low public support to grow it or renew it, whereas there is very high support for RE (85% in UK). This is a reality that the UK Government still seems to be ignoring. And with current pricing models, RE-Nuclear co-existence is problematic with high RE penetration (which might explain its dissing my nuclear advocates). We should listen to Ken and others who raise valid challenges. But instead of a shouting match, my approach would be to get the right people in a room – thoughtful ones like Ken – with a whiteboard and a good model to test different scenarios, and apply some divergent thinking – no idea too crazy. But at some point constraints have to be applied: physics, timescales, public acceptance, and whatever. We need to have this discussion shared openly so we can all contribute, and difficult issues like land-use can be confronted and properly consulted on. This is not about smart people waving a piece of paper, but helping to inform the debate with workable options (which will be different for Algeria, the UK, and Nigeria; for all sorts of reasons). Currently, I don’t see this conversation being had – certainly not in the UK where the Tories and Labour are both in self-destruct mode on other matters, and where even the Green seem not to really appreciate the scale of the problem and offer simplistic platitudes not strategies. Which is why the people have to take this discussion into their own hands. The national politicians are failing to show leadership, so it has to come bottom up. Not in blogs and rants on twitter (even if they have a role), but through community action. I am not claiming great progress but I got together with locals – including local politicians, engineers. doctors, scientists, hydrologists, teachers, anyone who is interested and wants to contribute or support – in the town I live in to build the conversation and develop local projects. We have started small, and that is fine, but are aiming to scale-up our ambition, working with the local council, schools, restaurants, churches, and more. Teamwork is better than struggling alone, that is for sure, and I think that community based action can connect what is happening in one’s personal life (a la Peter Kalmus’s ‘Being the Change’) with what is coming top down. Realism and hope are not mutually exclusive. With a 3 year old granddaughter, and a 5 week year old grandson (both of whom have life expectancies that take them to the end of this century … the year that the IPCC uses for its projections), can I afford not to seek out hope? Keith, et al, CO2 carbon capture, 2018: Better. Still a ways from large scale financial feasibility, which needs to be about US$1/tonne CO2.